Focus On Travel: Boys Camping Escape - Leap in! 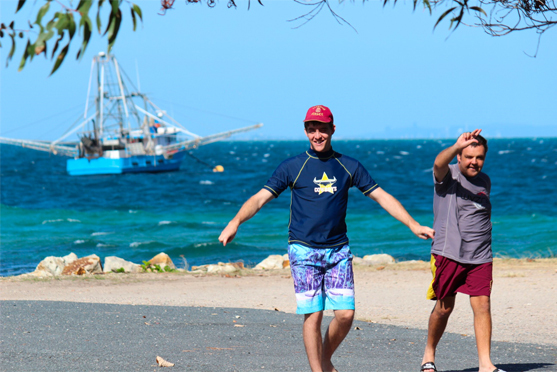 Ben and David* have just returned from a 3-day Boys’ Camping Escape on Stradbroke Island along with six other adventurers. Before this trip, Ben had been camping only once, and found that due to his depression and anxiety he was nervous to try again. David is deaf and doesn’t really use sign language so found camping difficult. Thanks to the combined efforts of the camping crew and Ben and David’s support workers, both of the boys had breakthroughs while on the trip. From being greeted by a wild koala at the gate of their campsite, to exploring remote parts of Straddie in a 4WD truck, the trip was a thrill a minute – fishing, catching pipis, swimming, riding the all-terrain wheelchair, eating together, and sitting around the campfire singing and laughing; 100% participation in all activities! Ben felt comfortable participating in activities and slept soundly both nights; uncommon for him in unfamiliar surroundings. David was so relaxed and smiley that when his support worker came to pick him up at the end of trip, he said he hadn’t seen him looking this happy in a long time. Best of all, the two became close friends and supported each other throughout the holiday. *Ben and David travelled with Beyond Borders Travel and we’ve changed their names to protect their privacy. Thinking about travelling? How travel works with the NDIS. Any of the support you require to go on holidays or supported small-group adventures can typically be funded by the NDIS out of your Core Support budget under Assistance with Daily Living and Assistance with Social and Community Participation. The cost of support varies depending on the destination, the duration of the trip and the support needs of each individual. The standard support ratio is 1:4, however 1:1 support is also offered. The out-of-pocket expenses not funded under the NDIS are the costs that would be incurred by anyone going on holiday, such as transportation (like car travel, flights or rail), meals, accommodation and sightseeing. Our friends at Beyond Borders Travel offer enriching and accessible travel experiences for people of all abilities. Accommodation, transportation, meals, sightseeing, activities and support are included. The organisation is a registered provider under the NDIS and there is no eligibility criteria. Find out how you can maximise your NDIS budget to pay for supported small-group adventures through Beyond Borders Travel’s flexible funding options. You may be able to draw from other line items to fund more of your trip through your plan and reduce your out-of-pocket expense. Like to know more about this holiday or others? Visit the Beyond Borders Travel Expo. Find out more about how travel can work with your NDIS Plan and speak with travel experts about tours, cruises, festivals, independent and supported trips to destinations throughout Australia and internationally. Register to get your free tickets with Event Brite click here or call the Beyond Borders Travel team on (07) 3867 2518.